In Rinpa painting, plants and flowers are often selected as subjects and paired according to their association with particular seasons, functioning as a way to allude to specific literary references. Edo-period artists like Tawaraya Sōtatsu (fl. early 17th century) and his successor Kitagawa Sōsetsu were fond of including classical court poetry and literary references in their paintings. 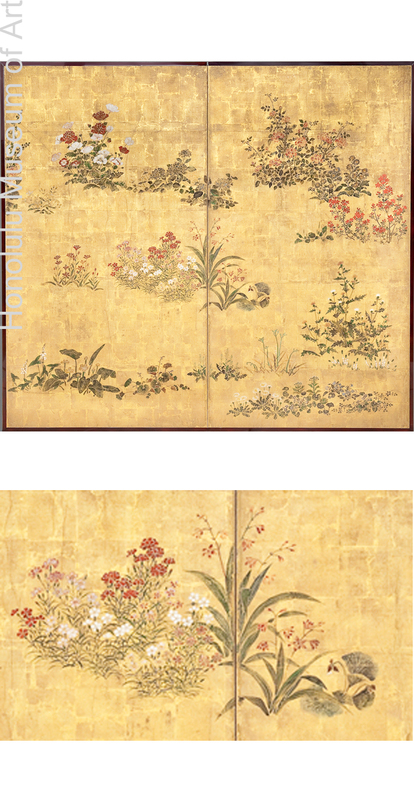 Sōsetsu is particularly known for his decorative flower paintings on folding screens and hanging scrolls, and in comparison with Sōtatsu, Sōsetsu’s work is perceived to be more closely focused on capturing the natural appearance of the flowers, but not, of course, to the exclusion of Rinpa’s decorative aspect. In Wild Flowers, Sōsetsu has taken the liberty of gathering and positioning flowers that would not have bloomed during the same time of year. The work features an abundance of different flowers, including azaleas, camellias, and peonies. Pigments forming the shapes of the flowers were directly applied to the gold-leaf painting surface, following the mokkotsu technique, in which the mineral pigments cover ink outlines, giving the impression of a work created entirely through pigment. The composition is formatted in a semi-circular fashion, a rather unusual decision for Sōsetsu. Thus, it is conceivable that the screen was originally one of a pair, a possibility suggested by details on the left side of the screen, such as the abruptly cropped cluster of flowers. Lee, Sherman E., “Sōsetsu and Flowers,” The Bulletin of the Cleveland Museum of Art, vol. 57, No. 8 (Nov., 1970), p. 267.